Many days we hear someone talking about finding ourselves and more and more women are starting to want more of their lives. Even people who are very “successful” from a secular point of view want to find more inner and personal peace and happiness. Its like the cliché that “money can’t buy happiness”. I personally feel money definitely does not guarantee happiness in our lives – may short term pleasure, but not a deep down satisfying happiness. So, what can we do to feel better about ourselves and our lives? Many women and men can find themselves in this same situation, for any number of reason. They may be changing or losing their job, children may be leaving home, their relationships may be ending or just beginning. Any of these situations, and many more, can and should prompt us to take a look at our lives. When you face that moment in your life, how will you respond? Suzanne Gravelle is 49 Years old and has 3 children, 2 grandchildren who live in Nova Scotia. At the time this book goes to print she is single and homeless by choice, still travelling, seeking that place of comfort she will eventually call home. Find out where Suzanne is and listen to current interview on 1290 CJBK London, Ontario on Suzanne’s blog….. http://ontourwithsuzanne.blogspot.com. Suzanne will be releasing her second book titled “Finished” in March of 2012. 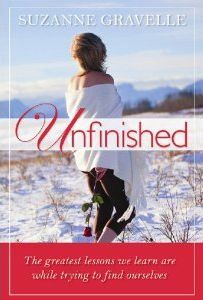 “Unfinished,” Suzanne’s debut book, begins the journey, the adventure, the memoir of a woman who after 30 years of raising her three children, most of it as a single mother, who suddenly finds herself at the most confusing, complicated cross roads of her life, a life altering transition she had no idea was going to change her life forever. Looking forward to minimizing the material possessions in her life to maximize the quality, free from responsibilities of caring for children, a large home and property by herself, she was opening her mind and her heart to all, that for years, she willingly sacrificed until her children were looking after themselves. Then on the cusp of this freedom she suffered a heart break of such magnitude that it ripped her safe, comfortable world apart. But this heart break was only the catalyst that propelled her to embark upon the most remarkable, self-analyzing journey of her life. In the spring of 2010, Suzanne sold her home on the East Coast of Canada, put her important possessions in storage, packed up her truck, kissed her children, grandchildren and friends good bye and just drove away…Alone! Her self-imposed exile sent her into a solitary world of self-exploration, mental darkness, infused with loneliness and homesickness. Suzanne has been interviewed by radio stations and newspapers in the Toronto area and will be participating in conferences, T.V. talk shows, radio talk shows all across Canada and the USA while continuing her journey.